My hairdresser always uses gorgeous hair products when i have my hair done. 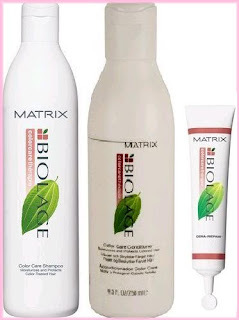 I found out that these products are by 'Matrix' and i LOVE them! 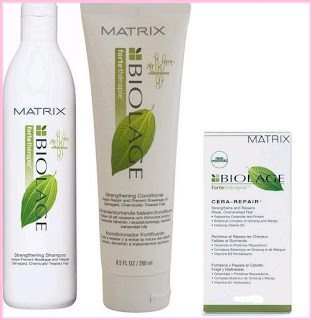 First, i bought the 'Biolage' range colour care. It made my hair look thicker, softer and healthier. The smell is beautiful and lasts all day (just like that salon finish!). The only one down side is I'm pretty sure it made my hair ever-so-slightly darker, even though it's 'colour care', it could be the winter as my hair does tend to grow faster, the roots appear sooner and unfortunatly the colour fades more quickly. I still think it did make my hair slightly darker, which is a shame because it means i most likely will not buy the 'colour care' range again, but it made me see how amazing these products are so i bought a few more. 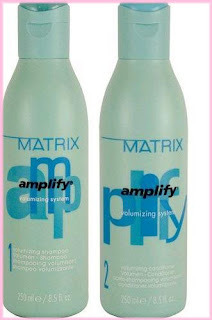 I have been using the 'Amplify' volumizing range this week and i really like, again it makes my hair look thicker and healthier. I would highly recommend these products to anyone. Matriz Amplify is great! I love how full it makes my hair and it smells so fresh. your hair is super duper pretty! gotta try these products! Your hair is just gorgeous!!! I stopped by a local drug store here in Canada...Rexall and they carry this line...I must try it!!! I have never been using Matrix before..looks like I should try...I am using Sebastian right now. I agree that hydratherapy is the best! 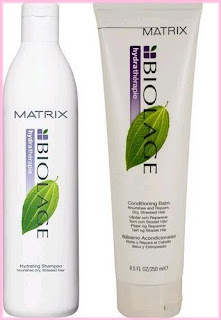 It's what I used when my hair was bleached and people were dumbfounded by how healthy my hair was! Tried 'Miracle 10" yesterday. Quite possibly the BEST thing I have EVER tired:) Check it out. all these products are good for extensions?? ?